You are a Health, WatSan or shelter specialist and on your next field trip you would like to collect a few GPS points to locate boreholes, get the distance to nearby hospitals or just the coordinates of refugee camps you visit or any other location that might be of interest to you. So now you are wondering what is the best way to achieve that? If it’s just the coordinates you need, you’re lucky it’s easy with a GPS receiver. You just add the points and later export them as gpx which can be added to Google Earth or any GIS software you might be familiar with. But what if you want to collect different types of points or more information on each point? And moreover who still uses GPS receivers in the age of mobile applications! Isn’t there an app for this? Of course there is! So let’s set out to look at a few options! 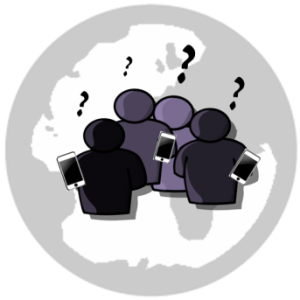 We’ve looked at many applications for mobile data collection. But here we will only discuss those that don’t require you to spend much time setting up accounts, building standardized questionnaires or web maps or even setting up entire server instances. 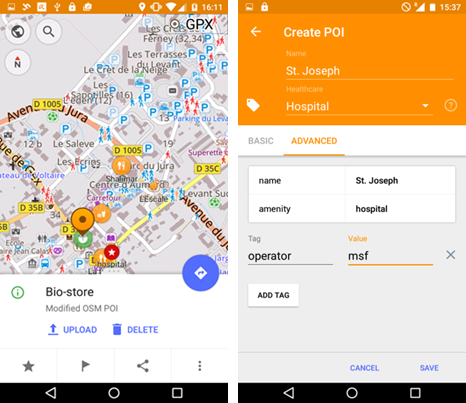 They still allow you to work offline with a map and collect points – and they are free! If you are willing to devote some time to set up an account on KoBo or another platform and learn how to prepare forms, or you have someone in your department who knows about ODK Collect: Well, go for it! Those advanced apps are much more customizable and they are as easy to use once you’re in the field. They just need much more time to set up and get ready for collection. The first two of the list are tools based on OpenStreetMap. You download them from the app store (Android or iOS) and as soon as you open the app and zoom to an area of interest, the OSM data will be downloaded to your phone. Since the data is now cached on your phone these areas are then available for offline use. The third one is only available for Android smartphones. 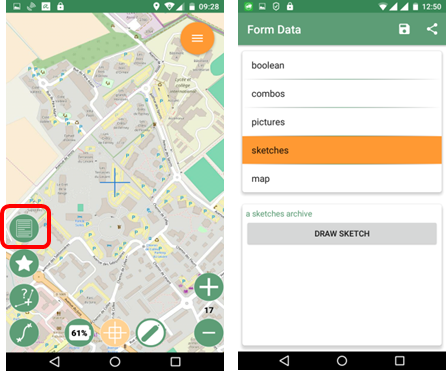 OsmAnd is very useful especially if you’re ready to share your data via the OpenStreetMap Platform. Think about it, the data you collect might be of interest to more people than just you! Your boreholes or hospitals – that’s surely something others would be interested in as well. In addition, you get a chance to see contributions from other collectors. Maybe your points of interest have already been collected. With OsmAnd, you can collect private bookmarks: “Favorites” – points that are of interest to you but that you don’t necessarily want to share. For such a point you can add a name and a description and then later export them as a GPX point. That might not seem so very exciting to you but there is more: The other way to collect points is available once you’ve enabled the “OSM editing” plugin, you can collect or edit OSM data. The exciting option here is that you can add any OSM tag you like and add attributes to your point. You want to mention that the borehole has a hand-pump or that the hospital is public, “pump = manual” or “operator:type=public” could be added. You will need to learn some “OSM” to take advantage of the full potential. Those points can be uploaded to OSM once you’re back with a WiFi connection and from there anyone can access and use the information you provided. 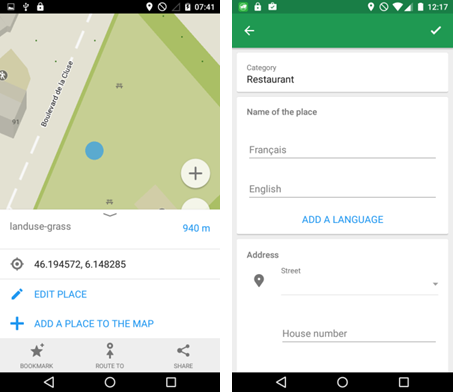 Maps.Me is in many ways similar to OsmAnd, you can either collect private bookmarks or collect and edit OSM data. But there are a few slight differences. Your private bookmarks are exported as KML making it easier for you if you like to use them in Google Earth later on. For the OSM data, you have less options and less details are displayed on the map. So you should check in advance that all you need can be collected. The upside of this – the interface and the map is a bit lighter and less overwhelming. So depending on what your preferences are, you might prefer one option over the other. GeoPaparazzi. For sure the user interface is not as nice and you can get a bit lost at first. But with a little bit of reading on their website you can learn how to create a form in json to put directly from your desktop on your phone and then you’re ready for a standardized data collection. To give you an idea, once you’ve installed the app and clicked on the document icon inside the map view you see the “Example” form. It is just there to show you what an actual form could include: text, numeric, date, single or multiple select questions. 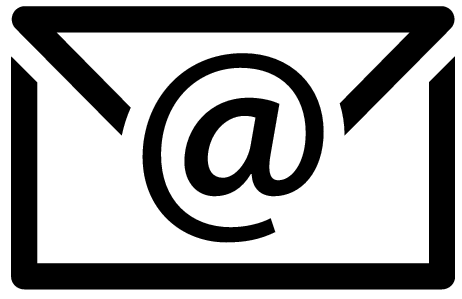 If you copy the form to your desktop and open it in a text-editor it is relatively easy to adapt. Replace the form on the phone once you’re done and you can start your collection. If, after the collection, you go back to the start screen and click on the export tab you can choose to export your data as KML. Back in the office copy the KML to your desktop and open it in Google Earth, you find that all the details you provided are included. So, this workflow can save you time on data cleaning and copying. But also this app doesn’t have it all: For example you have no easy integration with OSM. So if you want to share your data more broadly, you will have to find another way. In addition, this app doesn’t automatically download tiles of map data for you, it only stores those in cache that you have accessed already. So be sure to zoom in as much as you need over your area of interest before you go offline. Feel free to leave us a comment below if you think there are other tools that match the criteria and are worthwhile looking into! Friederike Alschner joined CartONG in November 2014 as a GIS Officer and has since worked on projects with UNHCR and ICRC.